Humans may live on Mars sometime in the not-too-distant future. And when people finally figure out how to colonize and live sustainably on the Red Planet, Budweiser would like them to celebrate by cracking open a cold one. During a panel at SXSW this year, Budweiser announced its intention to develop a beer people can drink in space. Carbonated beverages, like beer and soda, are hard to drink in microgravity due to the difference in pressure between the inside and outside of the can. Apart from a small sip of wine Buzz Aldrin took as part of his communion on the moon, drinking alcohol in space just doesn’t happen. Budweiser’s ambitious plan aims to change all that. But they’ll have to overcome some serious space hurdles first. The human tongue swells in space, altering the taste of food and drink. Mars’ atmospheric pressure is approximately 100 times smaller than Earth’s, which prevents the bubbles inside carbonated beverages from rising. This changes the consistency of the beer and makes digestion uncomfortable (without gravity, gasses and liquids do not separate inside the stomach, leading to a sensation known as “wet burps”). 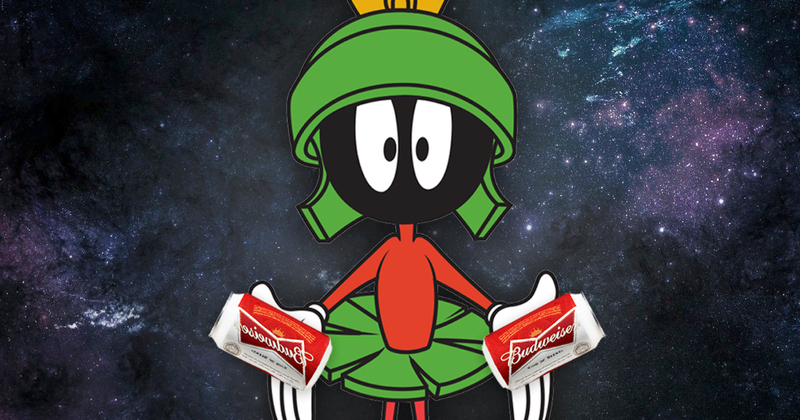 Budweiser is dreaming big with this new initiative; they don’t just want to send beer to space — they also want to set up beer-making facilities on Mars. To accomplish this, they’ll have to contend with the planet’s natural resources. As beer snobs know firsthand, Budweiser is comprised of 90% water. Mars has far less available water than Earth does and its water has a higher percentage of salt, which would give beer a bitter taste. Mars experiences serious temperature fluctuations (the planet can get as warm as 70 degrees Fahrenheit during the day, but temps drop to below -100 degrees at night). 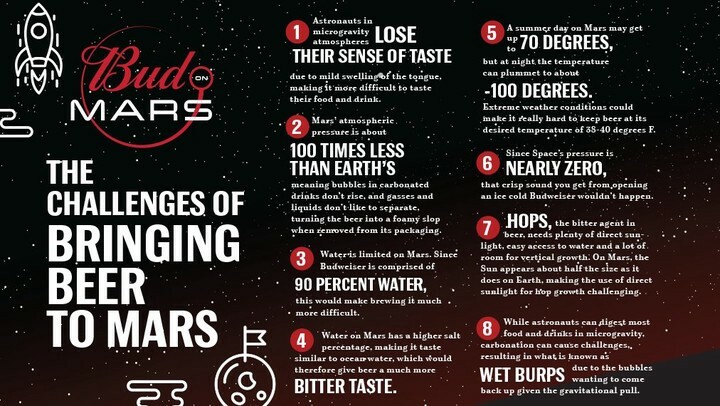 Mars receives far less sun exposure than Earth does, making it a challenge to grow the hops needed to brew the beer. The pressure in space is nearly zero, which means beer fans won’t get to enjoy the sounds of a beer can tab snapping as they open it. Despite the many challenges, Budweiser remains undeterred in its mission. Just as Hoover promised a chicken in every pot, Budweiser will not rest until there is a beer in every space explorer’s fridge. So here’s to Budweiser’s attempt to take one small step for man, one giant hangover for mankind.